If you want to understand the Russian Soul, you will have to be in the shoes of a Russian. However, Russian ushanka or chapka is another way of understanding the feeling of a Russian self. Russian culture is one and only in the world and only a Russian can understand the uniqueness or live the fullest of it. One of the secrets to know what Russian soul is to wear the Russian Army and civilian Ushanka Winter Fur Hats. The introduction of Russian ushanka hats has proved to be very successful in many countries and now we at RussianUshankahat.com represent them for everyone in any part of the world. The purpose of our website is to give opportunity to everyone who wants to buy or purchase Russian Army and military Ushanka Winter Fur Hats. You can create your own unique style and image with Russian Hats, Soviet and Russian Army Hat Badges, Russian army belt with buckle and stripped army shirt. Black, White, Grey and other colors of rabbit fur hat and fur material including faux fur hat collection would let you find something special at our online shopping portal. The key to get a good heat saver is to get the best quality fur material. Russian Ushanka is the reflection of passion and love as they are made from the best available materials on the planet for bold and beautiful people. Ushanka is symbol of status and grace not only in Russia but also in many parts of the world. It is a component of army uniform in Germany, China, USA, Canada and many more. Russian ushanka hat is the best heat saver. You can wear a variety of fake fur hat, sheepskin hat, and rabbit fur hat to protect yourself from severest winds and frosts. You will find the most popular fur hats from Russia that are known to be the most protective headgears for the Russian people even in Siberia. If you were under the impression that Russia does not have a navy then it is time to update your information. Russians have a navy and the stripped navy shirts are really popular throughout the world. Along with fur hats there is a very unusual wear known as the telnyashka. The stripped army shirt is another insignia of bravery to the army men in Russia. With the fall of the Soviet Union, the doors to the Russian world have opened for all. Now anyone can feel and experience the true soul or culture of Russia by wearing unique Navy stripped shirt or telnyashka. The sailors wore the Russian stripped shirt as undershirt. It is available in two styles and different colors. You can wear the shirt with sleeves as an undershirt in the winters or go for the sleeveless stripped shirt in the summer. Only the strongest of men used to wear this T-shirt and it symbolized the pride and great sign of manhood for its bearer. Many popular snipers and generals wore them and it soon became the mark of status. It is a part of official uniform and it was always visible under the crafted jackets. For the people in colder regions this stripped army shirt is indeed a necessity to keep one warm in the extreme weather. The real men wear stripped army shirt and Russian stripped shirts are available for women. Actually, they are quite unisex. Stripped shirts are not only available in Russia but the Russian soul wearers have made them popular around the world. You might see characters in the movies wearing stripped shirts. Girls and boys wearing stripes is a common sight in the other countries such as France, USA and Finland. On the streets of New York, you may bump into a lot of men and women in stripped army shirt and jeans. In Latin America, people wear stripped shirts under the suit jacket and it is a common sight to see a handsome man clad in gorgeous Navy stripped shirt under the suit in Munich. You can buy unimproved versions or copy of the original telnyashka in deep moody blue on white, black on purple or red on cream and so on. You can order small, medium and large sizes or go for the extra large or XXL size. It is stylish and available in pure cotton stretchy material. The shirt will not fade after laundering and they look great on every kind of figure and body. The unique cut and lines will accentuate the beauty of a feminine figure and boost the ripped off masculine body. You can order them for your sweetheart, friends and family or order for yourself to be in Russian spirits once again. If you are looking for an unusual gift for your spouse, partner, boss or a family member, select Russian ushanka. There are many types of ushanka hat such as bomber hat, trapper hat, Cossack hat and trooper hat. You will never forget their excited faces and gleaming eyes if you order them for your teenagers. Unisex fur hats become unusual and exceptional presents. Outclass and exceptional fur hats will keep your memories and you warm in the coming years. Bomber hats and as many people love to call them aviator hat is made from finest furs and leathers. The leather cap has two protective earflaps. The earflaps can be tied with a chinstrap. You can wear the hat with goggles and be a part of the fashionable crowd. Aviator hats grew famous in the 20th century when pilots started wearing them while flying open-cockpit planes. The hat kept their head warm and saved the ears from turning cold. The pilots used to wear goggles that kept their eyes safe from blizzards during flight. It became a fashion accessory later on. Plastic helmets replaced the bomber hat and people started wearing them as winter hats. You can combine the bomber hat with your fashionable attire and create your own fashion statement. Toasty trapper hat is not only a trend but also the perfect headgear to save you from severe frosts. From London to the streets of Paris, trapper and trooper hat is a pretty common sight. Pair them with jeans, darker leather jackets and flannel shirts. 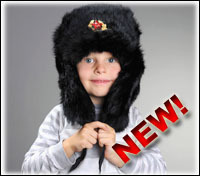 Men's ushanka, women fur hat and kids fur hat are known for their originality and quality. You can buy children fur hat for their extraordinary warmth and insulation properties. It is a lifetime investment and guarantees superb appearance. You can buy comfortable and cool red, white, black, grey and other colors of faux fur hat and rabbit fur hat that will never leave your child cold. Russian Ushanka is also made from soft and fluffy sheepskin. Mouton fur hat or sheepskin fur hat are the symbol of status and only the rich could wear them in the past. High-ranking officials in the Soviet army used to wear mouton or rabbit fur hat to keep their individuality and class. They used to put their hats in front of them while sitting for lunch at the table. You can get warmth, comfort, style and coziness by wearing the specially designed rabbit fur ushanka and fox fur hat. Being the supplier of unique fake fur hats, we take pride in presenting the classic and legendary real and artificial fur hat collection. Whether you are living in the freezing Alaskan wilderness or in the coldest arctic regions, trendy Russian fur hat collection will fulfill all your needs to remain warm and cozy all the time. Good old classic Russian hats are beyond doubt a symbol of status in Russia and they are an insignia of real fashionable soul. The shapka ushanka can be worn in three styles. Tie the flaps on the chin, at the back of your head or on the top of your head. Ushanka or earflaps hat in lamb’s wool version or artificial fur are now available on the internet at our website. You may not be able to buy them at any ordinary local boutique or mall. People who are interested in buying the real mouton fur hat, fox fur hat, rabbit fur hat and outstanding fake fur hat can search the categories at our website. Save your time, effort and energy, go through our online collection of Russian Army and civilian Ushanka Winter Fur Hats. You can also buy Soviet and Russian Army Hat Badges to match with your formal and casual dresses. Russian army belt with buckle is very popular item among the fashion conscious men and women. You can browse through numerous collections of vintage Russian hats, badges, stripped army shirts, faux fur hats at our website. Order online for you and your loving son, little princess, mom and dad.